In an effort to reduce weight and improve fuel economy, automakers continue to eliminate spare tires from new vehicles. According to new research from AAA, nearly one‐third (28 percent) of 2017 model year vehicles do not come with a spare tire as standard equipment, creating an unnecessary hassle and expense for drivers. 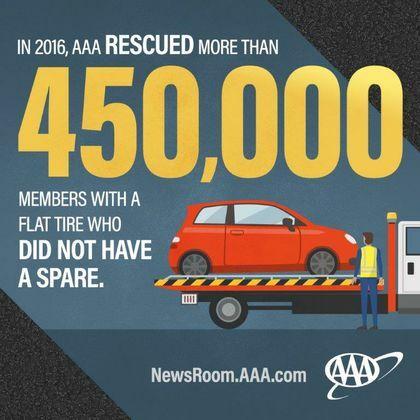 Last year alone, AAA came to the rescue to more than 450,000 members faced with a flat tire whose cars did not have a spare tire. To avoid a roadside surprise, AAA urges drivers to check their trunk for a spare tire before trouble strikes.